Ohhh, Steak and Lobster, yum! 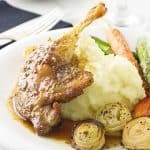 You will find this steakhouse classic listed on many restaurant menus, and usually with a hefty price tag. I am here to tell you that you can serve up a special steak and lobster dinner for two at a very modest cost. Thick, tender Eye of the Ribeye Steak and sweet succulent baby lobster tails. I do love a good steak and lobster dinner at a fine-dining restaurant, but those prices can take my breath, and appetite away! 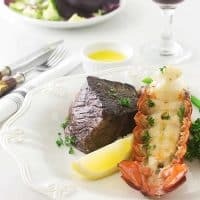 Depending on the restaurant that you visit a steak and lobster order for one person could cost you twice what our DIY cost us for two. Some swanky restaurants, with white tablecloths, candles, and ambiance present this fine entree with a tag of $40 per person. 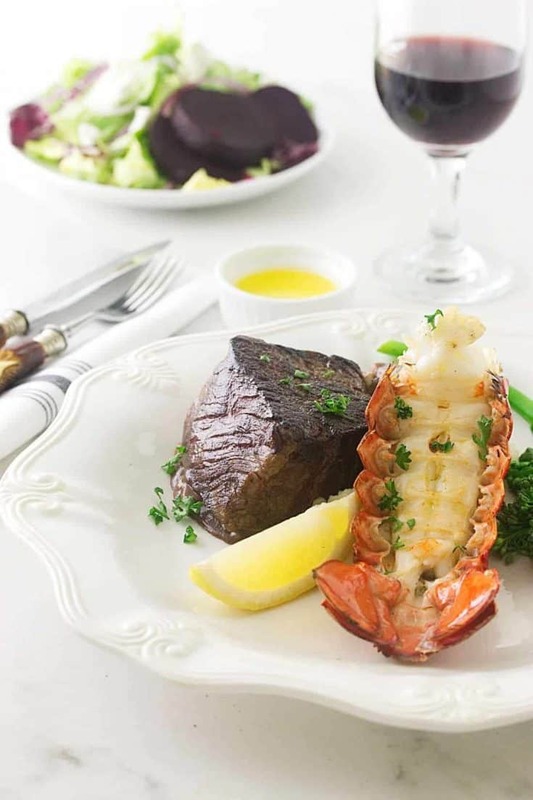 We paired each tender, juicy steak with a baby four-ounce succulent lobster tail for a cost of less than $15 per serving! Every other week at Costco they present a seafood roadshow with all manner of seafood. I usually stop and look, but this time I almost passed them up. The lobster tails caught my eye, and out of curiosity, I asked the price of two. I was pleasantly surprised at the price of $12 for two of them. Granted, they were small but combined with the steak it was very nice. I purchased one thick, Eye of the Ribeye steak weighing just shy of one-pound for $13. I divided the steak in half and combined it with the two small four-ounce lobster tails at the Costco Seafood Roadshow for $12. What is the Eye of the Ribeye? The eye of the ribeye is a whole ribeye with the cap removed and weighing about ten pounds or more. It can be purchased in chunks or in steaks. 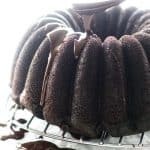 There is nice marveling throughout and a rich, juicy flavor. Although this cut is not quite, but almost, as tender as the filet mignon, in my opinion, it is superior in flavor. It will also cost less than a filet mignon. Don loves horseradish with his beef, this steak was served with a small dish of Fresh Horseradish Aioli. Both the large and small lobster tails were on display at the roadshow, the large tails are from the cold waters off the coast of Main. Each lobster tail weighed about one-pound and cost nearly $20 per pound. I opted to buy two of the small, fresh-water lobster tails weighing four-ounces each that cost $12 for both of them. They were the perfect size for our steak and lobster dinner and tasted fantastic dipped in our Garlic Butter Sauce. 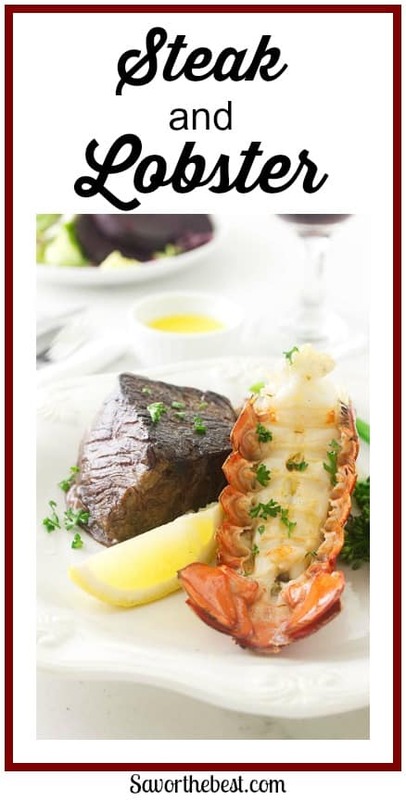 Steak and Lobster or Surf and Turf? Steak and lobster dinner for two! Cooking this classic steak and lobster dinner is easier than you would imagine. First of all, I removed the thin, tough membrane underneath the lobster tail. A pair of kitchen shears is the tool for this task. Just snip along each side of the tail next to where it attaches to the shell. Then pull the membrane loose at the upper portion. Next, soak some wooden skewers in water and insert them at the end, through the flesh. The wooden skewer will keep the tail from curling into a circle. Brush each tail with butter then season them with salt and roast for 8-10 minutes. Divide that big chunk of steak in half and season it with salt and pepper. Pan-roast the first side of each steak on a sizzling hot cast iron skillet for six to eight minutes. After the first side has a nice crust, flip them over and cook for another two to three additional minutes. What temperature should a steak be cooked to? This was a birthday dinner for Don and I told him it was my El Cheap-O steak and lobster specialty. We even used our own Syrah, home-crafted wine! 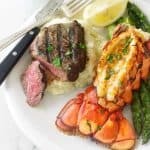 Have you made a steak and lobster dinner? If you did, we would love to see a picture. Tag us on Instagram. Steak and Lobster dinner for two! Thick, tender Eye of the Ribeye Steak and sweet succulent baby lobster tails. Serve with garlic butter sauce, fresh horseradish aioli, lemon wedges and sides of choice. 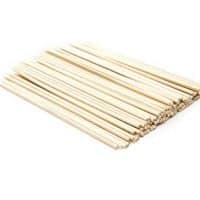 Soak the wooden skewers in water for at least 10 minutes. 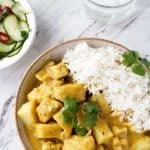 In a small microwave-safe pitcher or dish, combine the butter and lemon juice and melt in the microwave, reserve to cool. With kitchen shears, working from the underside of the lobster tails snip through the membrane up each side of the tail where it joins with the shell. Pull the membrane loose at the top and discard. Remove the skewers from the water and insert through the flesh at the bottom of the tail to the upper portion as indicated in the photo. 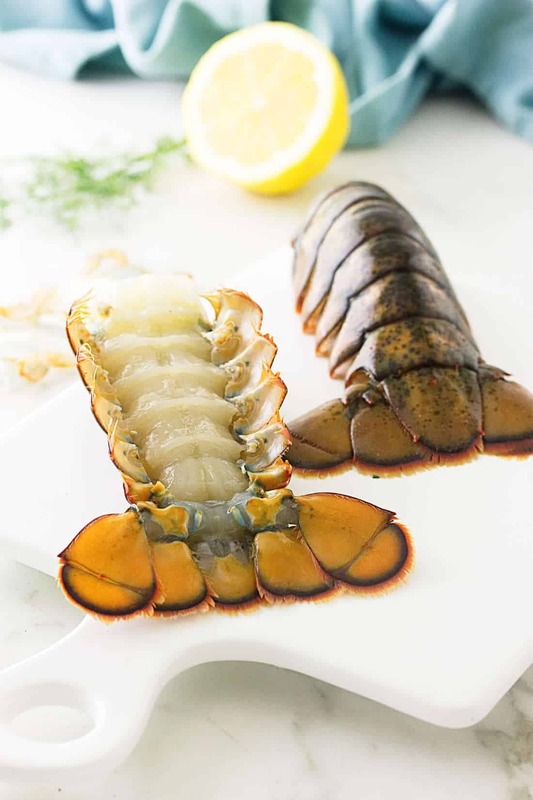 Place the prepared lobster tails on a sheet pan, shell side down and brush melted butter over the exposed underside of the lobster tail. Sprinkle with salt. 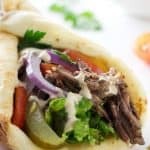 Set aside until later, you will start to bake these as soon as you start to cook the steak. 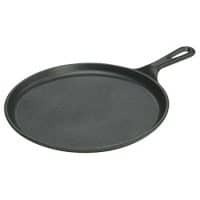 Heat a cast iron griddle or skillet over medium-high heat to smoking hot. Divide the steak equally and brush both sides of each steak with oil and season with salt and pepper. Add steaks to the hot griddle and cook for 6-7 minutes on the first side. Do not move during cook time. As soon as the steaks are cooking, transfer the sheet pan with the lobster tails to the oven and roast until just cooked through and opaque in the center, 8 to 10 minutes. Reheat the melted butter and divide into two small dipping dishes. Meanwhile, flip the steaks and cook on the reverse side for an additional 2-3 minutes until they are medium-rare (about 130°F) or to the desired doneness, 8 to 10 minutes total. Transfer to a plate and allow to rest 5 minutes. 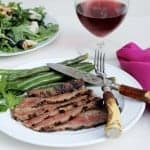 Place a steak on each serving plate and transfer the sheet pan from the oven, remove the wooden skewers from the lobster tails and place each one on a plate. Drizzle with lemon juice and sprinkle both the steaks and lobster tails with chopped parsley. Serve with steamed broccolini and mashed potatoes, garlic butter sauce for the lobster and fresh horseradish aioli for the steak. Fill a Mason jar with cold water and add the wooden skewers to soak. Add the lid to the top to keep them immersed. This works even on the large lobster tails although you may need to use (clean) garden or craft snippers to snip the heavier shell attachments. Cooking the steak longer on the first side before turning will give a nice deep crust and juicy interior. 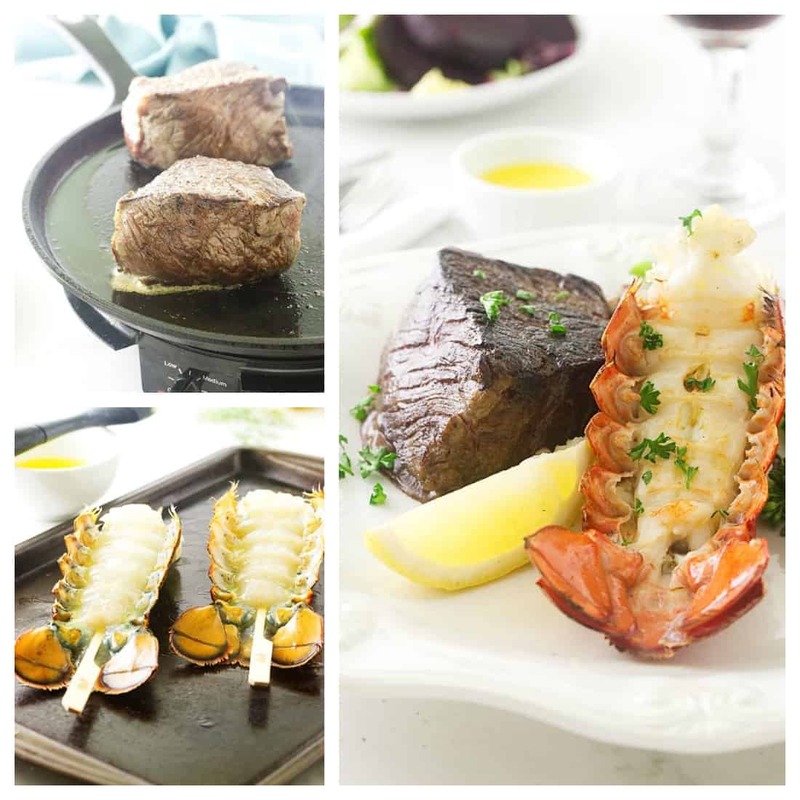 Steak and lobster is such a classic pairing! But agree about steakhouse prices — insane! And their portion sizes tend to be too big. We always split a steak between the two of us, just like you’ve done here — much more sensible way to eat. And ribeye is my favorite steak — SO MUCH flavor. Good stuff — thanks. This is just a dream combination, I love it! Steak and lobster is definitely far less expensive made at home! We’ve started doing a big dinner at our vacation home in OBX instead of going out to the raw bar, and it’s literally a fraction of what we would normally spend. Thanks for the tip on using skewers with the lobster tails! Ha, ha, Natalie….tell him to get the white tablecloth, candles and flowers too 🙂 Enjoy! 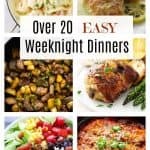 Looks like the perfect dinner for date night in! I love a great steak; and my husband loves lobster.